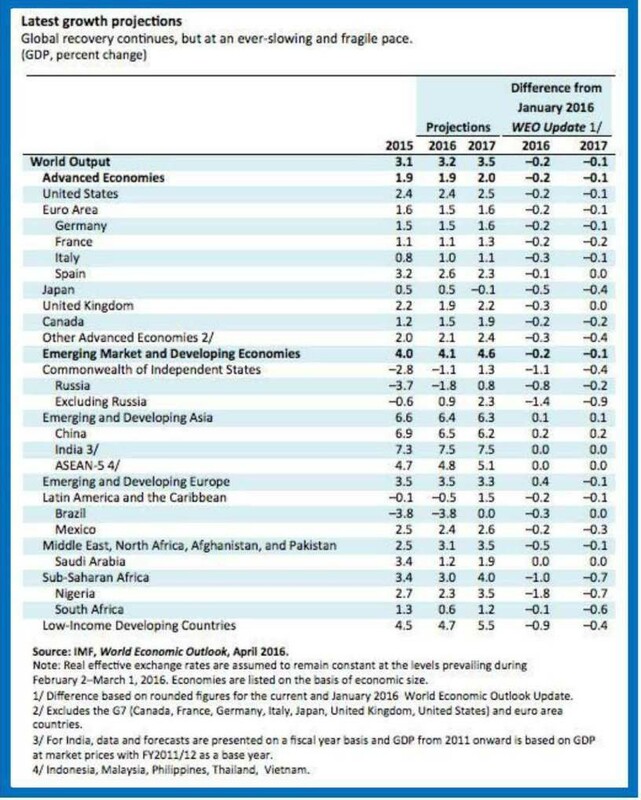 The downgraded forecasts reflect a broad-based slowdown across all countries. That slowdown results from continuing trends that we have highlighted in earlier editions of the World Economic Outlook. As always, there is considerable diversity in performance within groups. -Since last summer, we have seen two distinct rounds of global financial turbulence. They featured abrupt sell-offs of risky assets, heightened risk aversion, spikes in emerging-market sovereign spreads, and sharp falls in prices of oil and other commodities. Markets largely recovered both times, but investors have arguably reacted more than changing fundamentals would have warranted, both on the downswing and the upswing. There is a risk that further bouts of volatility feed through to the broader economy. As the new Global Financial Stability Report documents, these financial swings overlie a steady trend of global financial tightening. The factors behind it include increasing net capital outflows from emerging markets. While most have managed to cope with these so far, as this World Economic Outlook discusses, more strains could begin to appear. -Continuing violent instability in a number of countries, notably Syria, continues to crater their economies, driving millions of refugees to surrounding countries as well as to Europe. This is a humanitarian disaster. It has challenged the European Union’s capacity to preserve open internal borders, and as the incidence of terrorism has increased, the strains have only grown. Coupled with other economic pressures, the result in Europe has been a rising tide of inward-looking nationalism. One manifestation is the real possibility that the United Kingdom exits the European Union, damaging a wide range of trade and investment relationships At the same time, across Europe, the political consensus that once propelled the European project is fraying. In other advanced countries as in Europe, including in the United States, a backlash against cross-border economic integration threatens to halt or even reverse the postwar trend of ever more open trade. And unfortunately, there is more. Several large emerging market economies face deep contractions due to internal political strife or geopolitical pressures, and a number of low-income and emerging market countries suffer El Niño-related drought or flooding. The costs could escalate. -The weaker is growth, the greater the chance that the preceding risks, if some materialize, pull the world economy below stalling speed, where demand is insufficient to avoid a low-growth, deflationary equilibrium that some economists have characterized as secular stagnation. -In many countries, lack of wage growth and greater inequality have created a widespread sense that economic growth has benefited mobile elites and owners of capital disproportionately, leaving too many others behind. Lower growth reinforces the turn toward inward-looking and nationalistic policies. -In brief: lower growth means less room for error.